High-Quality Router from GS Machine Inc.
At long last, Coyote Design released its first catalog. Just like its locks, Coyote Design wanted its new catalog to be different and functional. Designed to be hung in the office or the lab, the Coyote catalog is easily accessible. Call today or go online to sign up to be the first on your block with a Coyote Design catalog. SPS has released a special-issue catalog--the SPS Liners & Sleeves Catalog-Summer 2003 edition--containing all the liners and sleeves sold by SPS. The catalog complements the complete 1,013-page catalog released in June 2002 and the supplemental spring catalog issued earlier this year. The SPS Liner & Sleeves Catalog includes a wide range of manufacturers--ALPS, ESP, Euro International, Medipro, Ohio Willow Wood, and Silipos--and detailed product specifications. User-friendly ordering examples and illustrative guides make ordering easier. Catalogs were forwarded to customers in mid-August. The Ultra Tru-Align Universal Alignment System from V-Tech Systems is a versatile tool for aligning prosthetic and orthotic joints. The patented design offers maximum flexibility in establishing a secure setup while allowing easy removal of the device. 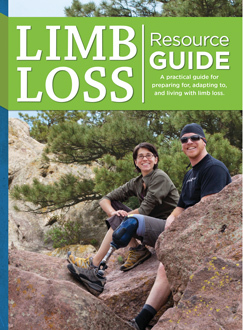 A series of Alignment Tabs accommodates virtually all prosthetic and orthotic joints. Combined with our Vertical Fabricating System, the Ultra Tru-Align Universal Alignment System allows you to standardize aligning and manufacturing procedures regardless of what type of joints are used. 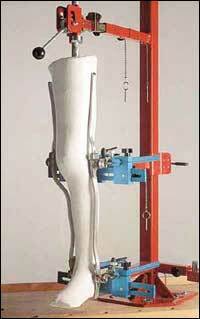 This provides efficient and uncompromising results for alignment and fabrication. 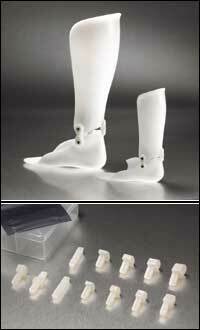 Otto Bock Health Care has launched the SNAPSTOP", a new plantarflexion stop for thermoplastic AFOs. The new SNAPSTOP is a unique, modular system that allows stops to be interchanged without glues, screws, or any adaptations to the AFO. Besides simplifying fabrication, it gives the practitioner, therapist, or the patient the flexibility to switch stops for different activities. The SNAPSTOP is available in adult and pediatric configurations in a variety of package put-ups, including kits with a full range of stops, as pairs, or as single stops. This next-generation stop is more adjustable, quieter, and easier to fabricate--a clever solution to some complex problems. No one offers more support for your patients than U.S. Orthotics. The Model KW6 proves just that. 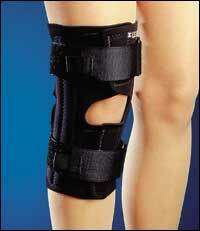 This wraparound knee support features stainless steel polycentric side hinges with 2" adjustable Velcro® straps and an open popliteal. 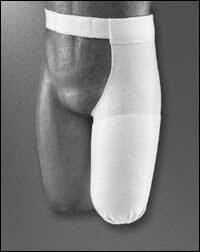 It opens flat, wraps around, and is easy to apply--excellent for patients who cannot pull on a traditional neoprene knee sleeve. U.S. Orthotics is recognized as one of the industry leaders in the design, manufacturing, and servicing of orthopedic products. It is preferred by those who provide the best care for their patients, with competitive pricing and topnotch service. Made in the USA. The new College Park Venture successfully integrates high-performance function with a customizable design that is comfortable to wear--all day, every day. 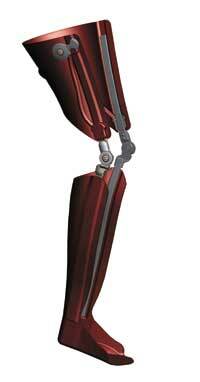 The Venture features Adjustable Stride Control", which allows prosthetists to customize an individual's gait. 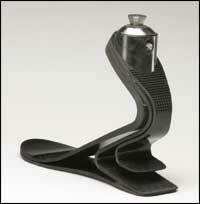 The Stride Control adjuster is located on the ankle bone and determines preload on the bumpers. 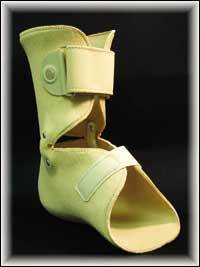 It provides gait adjustment of plantar and dorsiflexion resistance without the need to change soft components. Adjustable Stride Control helps provide the Venture with the versatility required for active lifestyles. Venture--the ultimate fusion of power and agility. Since being introduced to the market just a few months ago, the Renegade foot from Freedom Innova-tions has received rave reviews from numerous patients. Prosthetist Mike Norell said, "I have a patient who is playing football at a NCAA Division I school and wearing a Renegade from Freedom Innovations. It took me three years to find the right foot for him." Jeremy Burleson, also wearing a Renegade, is training to throw the discus at the 2004 Paralympics. Pro skater Casey Piretti has also switched to the Renegade. Join the revolution in motion. Knit-Rite announces its most recent innovation, the new Compressogrip A/K Shrinker. These A/K Shrinkers for transfemoral applications provide the same advantages you've enjoyed with Knit-Rite's original B/K Compressogrip Shrinker. The A/K version adds clinical efficacy, lower cost, and greatly reduced inventory compared with other similar products. The Compressogrip AK features stretch in all directions for improved fitting qualities. Increased power in the elastic provides a slightly heavier fabric than that used for the B/K Compressogrip Shrinkers. 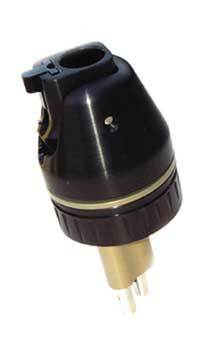 The Compressogrip AK features a sliding belt design for universal right or left applications. Safe Stance Control, Dynamic Assist—Without Locking the Knee! PEL Supply Company now offers the recently introduced pediatric CAPP Hand from Hosmer Dorrance Corporation, a Fillauer company. The new CAPP Hand, now with an integrated urethane body, uses the same internal spring-loaded voluntary-opening (VO) mechanism in the original CAPP Terminal Device developed by the Child Amputee Prosthetic Program in southern California. Eliminating the need for a glove, the tough but pliable exterior looks more natural and preserves function and durability. The VO mechanism can hold items ranging in size from a telephone handset to a pen. The CAPP Hand has three different pinch springs to adjust grip force. Freedom Arch X-PRESS with its generous 20" x 20" table and heavy-duty 16-gauge steel frame provides optimum, flexible onsite molding capabilities for your podiatric needs. The super-fast pull-down is perfect for graphite, and the bladder changes in seconds with no tools required! Call now for pricing and availability. F-Scan Mobile System from Tekscan Inc. The F-Scan Mobile® by Tekscan records bipedal plantar pressures and forces, yet its unique design allows for data collection without cables running from the PC to your subject. Combined with Tekscan's ultra-thin, high-resolution sensors, the system maximizes mobility and minimizes disruption to natural gait for the truest pressure recordings. 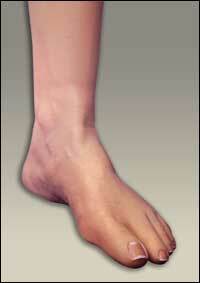 The F-Scan Mobile has unlimited applications, such as gait analysis or orthotic efficacy. With a sampling rate up to 500 Hz, it is ideal for use in sports applications. Easy to set up, the lightweight system offers large onboard data file recording capacity with two-plus hours of continuous runtime for data collection. SKINERGY", the award-winning lower-extremity cosmesis from RSLSTEEPER, will now be sold through SPS and LTI (LTI also supplies OPGA members) in the US. SKINERGY has been a success throughout the world, and RSLSTEEPER is confident the product will become commonly used in every clinical facility across the US. RSLSTEEPER has been producing cosmetic polymer products for many years, including prosthetic cosmetic gloves and custom high-definition silicone. RSLSTEEPER is also a major manufacturer of upper-extremity components and the largest P&O clinical service provider to the British National Health Service. The new Mid-Leg and Bermuda casting socks eliminate all wrinkling and provide excellent conformity to the foot, ankle, and leg contours, producing improved negative cast. 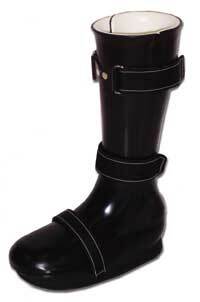 These fitted polyester socks are impregnated with a fast-setting polyurethane water-curable resin. A glass-smooth finish is achieved in minutes, allowing immediate shipping or scanning without damage. 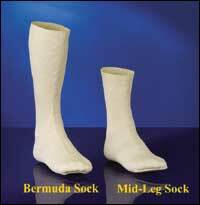 The Bermuda cast sock is approximately 30 percent less in cost than the 30" STS tubular fiberglass sock. The innovative removal system is quick, simple, and safe. As with all STS products, there is no mess of plaster of Paris. 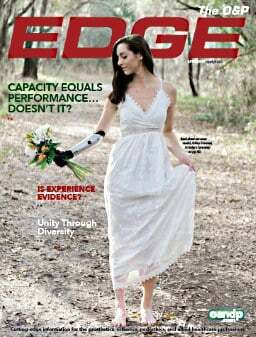 The new Body-Powered Five-Function Wrist is designed to enable upper-extremity amputees flexibility in daily living. A quick-disconnect allows easy changes to a body-powered hook, passive hand, or a specialty terminal device such as the NAbler II" terminal device and the entire range of NAbler II adapted tools.